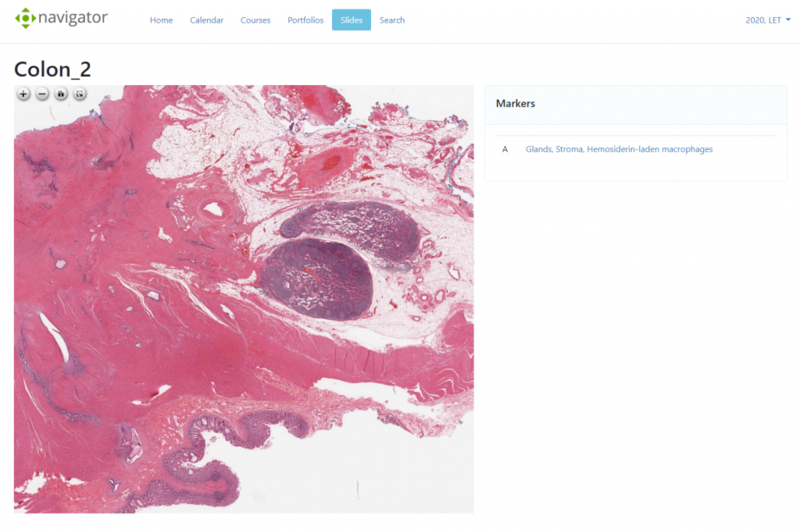 Virtual Slides allow students to inspect high resolution Pathology slides online. Now in Navigator, faculty can annotate slides with markers and sections to facilitate student learning. Using a modern, open-source web-based viewer for high-resolution zoomable images called OpenSeadragon, virtual slides have been integrated into Navigator LMS. Faculty can link to the slides from their courses, and they can also be embedded into self-assessments. In 2018, the Lab is looking to work with Dr. Cynthia Lance Jones to increase the number of digital slides available to students.